Hi guys, I have a problem with my gumball machine. 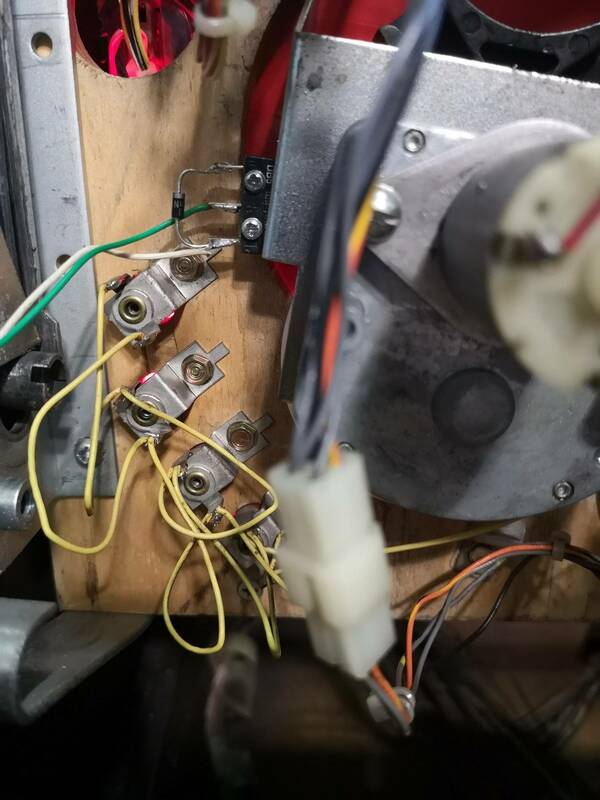 The engine of the gumball machine turns without problems, optos and geneva switch seem to work correctly but when I launch the Gumball's Continuous Test I'm still having a Geneva Switch Error. My machine has TZ's ROM 9.4CH and 5+1 balls inside trough. - Autofire launches ball --> Spiral opto OK --> Lane switch OK --> Popper OK --> Entry OK --> ball is inside the gumball machine. - The sequence above happens until 3 balls are charged inside gumball machine. No gumball will be dispensed during that operation and even after, is it correct or not? - When 3 balls are inside the gumball machine, the machine displays the "Check geneva switch" error message. PS: when I do the "empty gumballs" cycle, the gumball machine works perfect. The Exit switch works too. The geneva switch blade is brand new and the switch too. Must it be straight, lightly bended or something other? Do you have maybe some pictures to show me how it must be? What am I doing wrong? I love the TZ pinball machine, but this problem is driving me nuts. Thank you in advance for your advices! Pretty simply a geneva switch error means it is not triggering, or not triggering consistently (once per rotation of the cam). Are you seeing it trigger at all? Did you mount the diode correctly? Maybe the issue is in the switch matrix and the geneva switch is being triggered by "another switch". Get rid of 9.4CH. It has possible bugs, since it's a hack. If you are sure your geneva switch is working, 100% of the time(*), then switch ROMs, go back to 9.4H. Restore factory defaults, set it up, and give it a whirl. (*) - Put it in Continuous Mode for a good 30 minutes. If you get no errors after that, then it's good. Thanks for your answers. Here the pictures of the switch, diode and wires. About the EPROM, I had exactly the same problems with the 9.2 ROM. Here 2 videos of my pinball machine (empty gumball machine and continuous test). Okay, your continuous test failed. After loading three balls, it was supposed to release one from the gumball machine. A ball was not dispenced. The yellow handle on the front did not turn. The motor didn't even try to run. Likely you have an intermittent wire connection to the motor, the motor driver board, or the motor is locking up. I soldered the cables on the motor in the last months, they have a good connection with solder lugs. The strange point is that, when I do the "empty gumball" cycle, the engine turns without problems. Another thing I could try in the next days; remove the gearbox of the gumball machine, open it, clean everything and put some new grease on the gears inside. As you can see in my video, is my geneva switch working correctly? In the dispense all, yes. The error is being thrown because the CPU is telling the motor to tuirn, and it's not seeing the geneva switch close - because the motor's not running. Those videos are a bit strange.. the gumball machine tries to dispense a 4th ball even though it has seen (at least from the 3 geneva & exit switch triggers) 3 balls already get dispensed. The speed of the yellow part looks faster than I remember mine being too. Not very useful info, sorry. Your trough and outhole switches look flaky from what I can see. There isn't a clean movement of balls in the trough, to the outhole, to the autofire. At 0:31 in your video a ball gets moved to autofire and doesn't even trigger the outhole switch, where it should be sitting. I wonder whether the gumball doesn't register the 3rd ball going into the machine properly because of this? Ok, I fixed/aligned the switches of the trough, tested everything but I'm still having the geneva switch error. 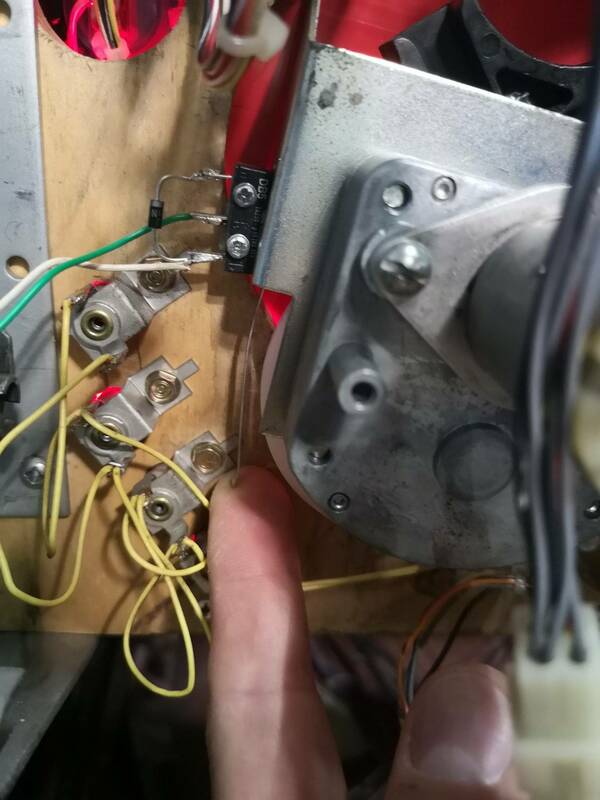 The "bump" in the video is just because I'm keeping the gumball machine with one hand on the siderail and with the another hand I'm activating che continuous test to start the motor. Recap: in the test everything is working correctly, during gameplay it does not. If so: the problem is in the switch matrix. Some other switch that is activated is causing the geneva switch to act up. Not really, considering that during the test every switch works correctly, the behaviour of the gumball cycle is not complete and strange. 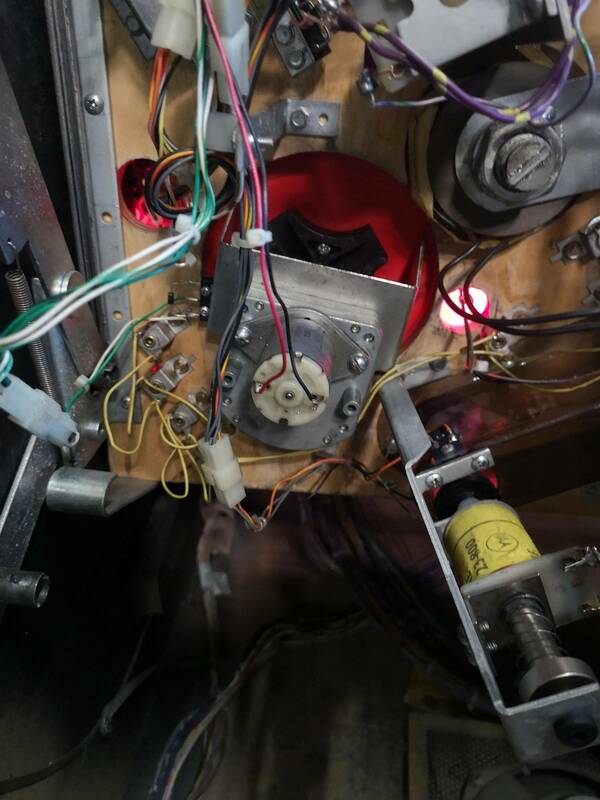 As recap, I could say so: 3 pinballs are loaded (without problems) in the gumball, the motor will not turn and the display after a few seconds shows "Check geneva switch". To be sure, tomorrow I will do a double check to the switch matrix. CPU is perfect, already tested with a device from Pinitech. I'm not sure I understand correctly. My assumption based on this thread: in the test the gumball works fine? I see the geneva switch is getting hit in the test making me think that both the motor and the switch are correct. So I'm assuming your gumball machine is working as it should. My best guess is that your trough opto's need a good cleaning or replacement. In the test the gumball doesn't dispense after loading 3 balls. I have the geneva switch error. Same problem during game play, the gumball loads a ball but doesn't dispense. Aah okay, my assumptions were incorrect. I will check with my TZ as soon as possible. And you're correct. Trough doesn't have opto's. I've tried almost everything (switch alignments, another cpu board...). I don't understand why the gumball motor works when I do the continuous test (only at the begin to unload the gumball machine) and when I do the "empty gumball machine" cycle but not during the continuous test/gameplay to release a ball. The Entry Opto on the wireform works, but could it be that, even if it works, it is defective and gives me problems? Is maybe not giving to the cpu's switch matrix a good and clean "signal"? Has anyone other ideas to solve my problem? the-ace last edited this post 5 days ago.